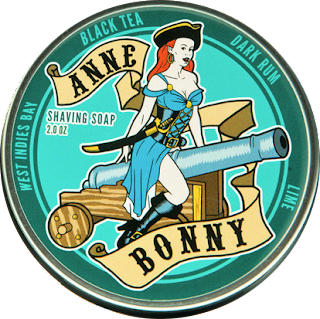 Today I’ll be talking about a great shaving soap from Dr. Jon’s called Anne Bonny. She is regarded as the first woman pirate but little is known about her. What we do know is she was one tuff woman for sure. This two-ounce tin has a screw on lid with labels showing the product name and scent notes on top and ingredients information along with website URL on the bottom. No side labels. When Jon set out making this soap it probably started as a Bay Rum but he ended up with West Indies Bay, Black Tea, Dark Rum and Lime making this unique scent. I feel that West Indies Bay and Black Tea dominate the scent with the lime coming out right at the end. I really don’t know how Jon comes up some of these scents. He does have a knack for making the most interesting on the market another example of that would be his Krampus which will be coming out later this year for the holidays. The texture of this soap is soft so I had no issues with placing it into my lathering bowl. I used my Maison Lambert brush and German 37 slant from Razorock for the shave. 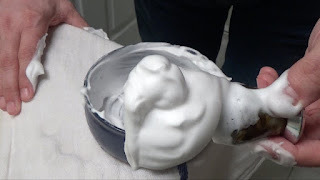 Just a brush full of warm water I was able to create a rich creamy lather in just a a few min. The lather covered my face and really penetrated my beard. The slickness and glide was just right with no irritation from my razor. So I had a great shave with Anne Bonny. If your into Bay Rum, then this should provide a new twist. All of Dr. Jon’s soaps work extremely well and best way to get into them is to invest $28.00 for his sample pack Volume 2. You get (9) 2.0oz of the finest shaving soaps that are truly unique.